A bit late putting this out there but on the 20th March the first rumours of a proposed takeover at Portsmouth surfaced. The following statement was issued by the PST. The PST board are aware that an article in ‘The News’ today will create significant interest. A club such as OURS, with its incredible fan base, is bound to attract interest from possible buyers, and it is our duty to listen to any serious and credible offer for the football club. If there is a serious and credible offer, our shareholders will decide the outcome. The 3 PST Directors of Portsmouth Community Football Club will be fully involved in discussions. We understand how much owning your club means and retaining an ownership stake will be central to any discussions we enter in to. We are in the process of finding a date for a shareholders meeting which will give you an opportunity to hear more information on any prospective bid to purchase the club, and a full opportunity to air your views. A date for this meeting will be communicated in due course. Since the club’s exit from administration in 2013, the board of directors and staff have worked tirelessly to restore our fans’ faith in the club and – as club custodians – have continually striven to improve both on and off-field performance. A cornerstone of this work has been our openness and transparency with shareholders and supporters alike, while at the same time also respecting the confidentiality and commercial sensitivity of business agreements and contracts. We would like to assure all shareholders and supporters that we have a robust process in place to deal with any potential offers of investment. If we reach a point where such an offer of investment into the club is made, then ultimately it will be for all our shareholders – of which the PST is the single largest – to decide whether such new investment would be in the club’s best interest. We believe this to be the true definition of a fan-owned club, allowing those supporters who have invested to have the final say on the future direction of the club. We will make no further comment at this stage and assure all fans that, as always, we continue to work in the best interests of Portsmouth Football Club. Which basically told us nothing. 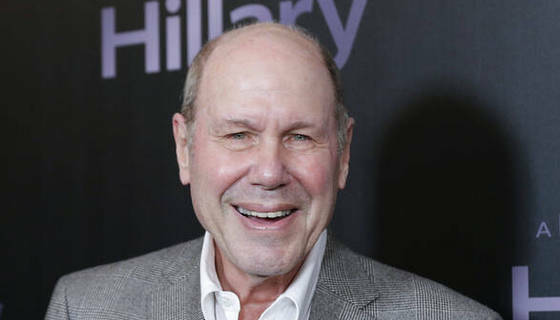 Many an article has surfaced since then relating to Mr Michael Eisner and he appears on the surface to be the real deal. Unlike previous potential owners who have had many skeletons in their closets this guy seems whiter than white having been CEO of both Disney and Paramount during his career. The man is also insanely rich. 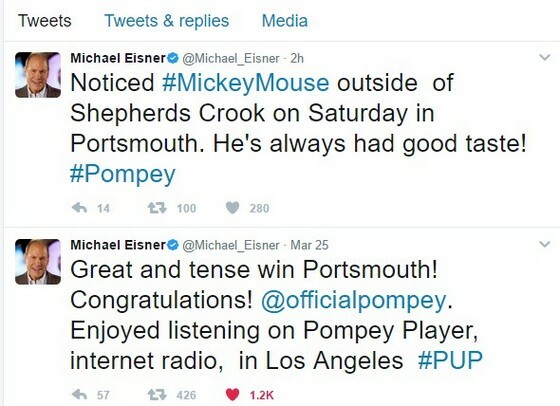 The stories soon moved beyond rumours to facts including three tweets from Mr Eisner himself relating to the club. It remains to be seen whether a deal will be done but in my opinion the club needs it to progress. The “fan owned” idea is great and can only take us so far. Some believe we can stay fan owned and make the Premier League, I believe that is impossible and an opinion backed up by most realists and those with proper knowledge of the club. Attendances of 16000+ give us a good basis but with no outside income it limits us to mid-table League One. In addition Fratton Park is falling down and there is a real possibility of parts of it closing in years to come. My small share stake will give me a vote, my understanding is that 75% of the vote is required to allow a sale to go through, the PST hold a stake of approx 48% which gived them the power of veto. On March 23rd the Club issued the following statement announcing a period of “exclusivity” meaning we will not negotiate a sale with anyone else in the meantime. Portsmouth Community Football Club would like to advise all shareholders and supporters that it has entered into an Exclusivity Agreement with Michael D. Eisner and his Tornante Group to allow for a period of discussions and negotiations to take place regarding a possible purchase of the club. The agreement is simply to ensure that during this period, which will be 70 days, the club will not engage in discussions with any other potential bidder and is standard practice in these situations. Q: Is this a done deal then? A: No, it is not. Put simply, this now enables the club to exclusively enter into a period of negotiation and due diligence with Mr Eisner and his Tornante Group to establish the detailed terms he proposes. Q: Due diligence – what does that entail? A: Mr Eisner and Tornante will be reviewing our business and financial information, and equally we will be checking out their own respective financial and business credentials. Q: What form will the negotiations take? A: The Board and Mr Eisner will look to negotiate the terms of what would effectively be the best and final offer they wish to make for the club; at which point we will advise all shareholders – both Presidents and those with the PST – on the terms of the offer. Shareholders will then be asked by the club and the PST to vote to either accept or reject the offer. Q: Who will be leading the negotiations? A: The Board have retained Trevor Birch to advise them during the negotiating process and he will liaise with all of the stakeholders in the club. Trevor is a managing director of global corporate advisory firm Duff and Phelps, and has unique experience of dealing not only with potential investors at a variety of clubs, but also possesses an insight specifically into PCFC, its community ethos and intricacies of the current fan ownership model. Q: Will there be an opportunity for Mr Eisner to explain in person his vision and plans for the club’s future to shareholders? A: Yes, the intention would be for Mr Eisner to explain his future strategy and plans for the club to all shareholders. As all our supporters are aware, on the pitch we now enter the final, crucial phase of the season. We can assure all fans that in the background we will now discreetly and privately engage in this next stage of discussions, while our focus will remain on supporting the football staff and players until the end of the season. The next few weeks will probably be rife with rumours and opinions (often stated as facts) but little will be made public. Pompey got their promotion charge back on track as they returned to winning ways against struggling Newport. Kyle Bennett opened the scoring late in the first half before Kal Naismith headed in a second after the interval. It appeared that the Blues were cruising towards three points, but Alex Samuel netted for the visitors to ensure a nervy finale. Paul Cook – in his 100th match in charge – made two changes from the side beaten at Stevenage the previous week. Bennett and Naismith had both recovered from injury to take their place in the starting 11, with Noel Hunt dropping to the bench and Christian Burgess serving a one-match ban. There was a minute’s silence before kick-off in tribute to those affected by the recent attack in London. Pompey soon started to dominate once the action got underway, but struggled to create too many clear-cut chances. The best ones fell to Eoin Doyle, but twice he just failed to get on the end of teasing deliveries from Naismith. And the on-loan Irishman was then unable to beat County keeper Joe Day from an acute angle after being slipped through by Carl Baker. But the striker was forced off midway through the first half after picking up an injury and replaced by Conor Chaplin. There had not been much for David Forde to worry about and when former Blues striker Ryan Bird cut the ball across the face of goal, Tom Davies and Michael Doyle combined to scramble it clear. But it was still Pompey causing the most problems, even if Day was not exactly being over-worked between the sticks. Bennett and Matt Clarke both had shots charged down, while a number of corners were comfortably dealt with. The Blues did break the deadlock just before the break, however, and it was a goal that was extremely easy on the eye. Baker intercepted the ball from Bird and slipped a superb pass through the Newport defence for BENNETT, who neatly slotted home. After seeing off some Newport pressure early in the second half, the hosts went in search of another goal. Chaplin was never really going to trouble Day with an audacious attempt from wide on the left, while Baker’s effort rose over the crossbar. Naismith then hit a cleanly-struck free-kick straight into the keeper’s arms, as the Blues started to take control. They almost doubled their advantage on 58 minutes, but Chaplin – who wanted the pass played earlier – could not quite convert Gareth Evans’ low cross. But Pompey did strengthen their lead just seconds later, as Bennett found Chaplin, who neatly chipped the ball up for an unmarked NAISMITH to head into the net. Their attacking intent did not end there, though, and Naismith saw a corner deflected into the side netting, while his second attempt was just too high for Clarke at the far post. It was not quite one-way traffic and Naismith eventually hacked the ball clear after a County corner caused some problems. Bennett received hearty applause from the Fratton faithful when he made way for Jamal Lowe on 71 minutes. But it was the visiting support almost cheering when Marlon Jackson sent the ball curling towards goal, only for Forde to make a fine save. Newport did reduce their deficit moments later, though, with Samuel rising to convert Sean Rigg’s cross from the right. And they come close to equalising on 78 minutes as the hosts started to get sloppy, with Forde coming off his line to deny Jackson. County’s confidence had risen and Jack Whatmough replaced Naismith as Pompey tried to shore things up. The nerves were starting to grow inside Fratton Park and Evans did well to take the ball off the foot of Samuel as he shaped to shoot. But the Blues saw out the closing stages with relative ease to seal a valuable victory in the battle for promotion. Really enjoyed his energy and perspective during the press conference today...Welcome to Philly AV!!! A fairly standard British rom-com with the added American. 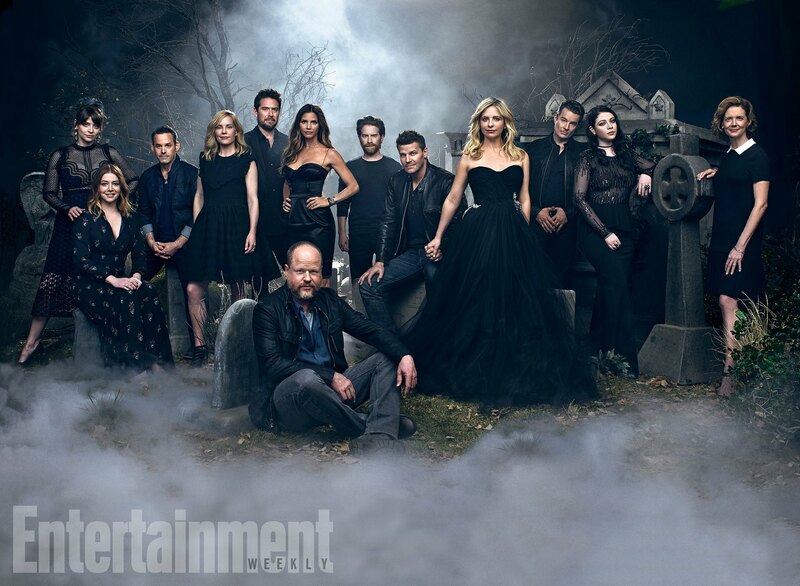 Loved Anna Faris not playing the dumb blonde for once. Pompey brought their fine away form back to Fratton Park with a rout of Grimsby under the floodlights. There was a touch of fortune about the first two goals, with Kyle Bennett and Danny Rose both benefiting from wicked deflections. But it was more than luck that saw the Blues strengthen their promotion credentials, as they put their foot on the accelerator. The points were secured with a couple more strikes either side of the interval, as first Carl Baker and then Kal Naismith got in on the fun. Paul Cook stuck with the same side that cruised to victory against Colchester at the weekend. And he was almost rewarded with an early goal, as Baker flashed a shot narrowly over the bar soon after kick-off. But it was Grimsby who looked more dangerous in the opening stages and Akwasi Asante saw a shot deflected narrowly wide following an untimely slip by Matt Clarke. They went even closer moments later, with Zak Mills’ fierce long-range drive cannoning against the post. And David Forde was soon called into action to push another decent attempt by Asante over the crossbar. But the Blues scored against the run of play on 12 minutes, as BENNETT tried his luck from the edge of the box and the ball took a huge deflection to loop over Mariners keeper James McKeown and into the net. From that point on the hosts dominated and Eoin Doyle could not quite connect with Gareth Evans’ dangerous low delivery. A back-pedalling Naismith then got on the end of another Evans cross and watched as his header flew inches past the post. The advantage was doubled on 35 minutes, however, when Bennett dummied Evans’ pass and ROSE hit a shot that took another deflection to beat McKeown. Pompey kept pouring forward and when Baker slipped a fine ball through to Naismith, the winger’s cut-back was diverted just behind the onrushing Eoin Doyle. There was a blow for the Blues just before the break, though, as Bennett went down injured and had to be replaced by Gary Roberts. But the mood soon picked up and there was a third goal in stoppage-time, with BAKER collecting Evans’ pass and beating McKeown at his near post with a ferocious finish. And it got even better for the hosts just 30 seconds after the restart when McKeown failed to hold Baker’s drive and NAISMITH slotted home the loose ball. Pompey’s players were full of confidence and lining up to shoot against a stunned opposition defence, but the next effort from Baker ended up high in the Fratton End. Perhaps unsurprisingly, however, some of the intensity went out of their performance as the half progressed. Evans hit a clean shot on target just past the hour mark, but this time the ball was safely held by McKeown. Pompey were dealt another injury blow on 68 minutes when Naismith signalled to come off after hurting his hamstring, with Jamal Lowe replacing him. That failed to dampen the hosts’ dominance, though, and McKeown dived to his left to beat away Baker’s 25-yard drive. Lowe then whipped in a cross from the right that was just behind Eoin Doyle and the on-loan striker could only head wide. There was a jovial feel inside the stadium, with the Fratton End asking for a song from each stand – who duly obliged. And the Blues saw out the closing stages in complete comfort to secure a third successive victory, with a third successive clean sheet. Pompey ran riot at Colchester to strengthen their position inside League Two’s top three. It was a display of attacking supremacy from the Blues, who arguably deserved to win by more than the four-goal margin. Eoin Doyle got the ball rolling during a first half that saw the visitors grow stronger as it progressed. And they moved comfortably through the gears after the interval, as Kyle Bennett, Danny Rose and Michael Doyle all got in on the act. Paul Cook stuck with the same side that comfortably beat Crawley earlier in the week. But it was the hosts who made the brighter start and Brennan Dickenson did well down to the left, only to let himself down with the ball into the box. Pompey soon began to settle and threaten going forward themselves, though, with some neat attacking play. Eoin Doyle could not quite get on the end of an excellent Carl Baker cross, while a snap-shot from Kal Naismith was safely held by Colchester keeper Sam Walker. Then when a cross was only partially dealt with by the United defence, Enda Stevens followed up with a volley that Walker was able to collect. But the Blues did break the deadlock on 22 minutes, with Naismith sending the ball back into the box after his corner had been blocked and Eoin DOYLE heading home from close range. He was not too far away from adding another soon after, but could not quite get on the end of Bennett’s near-post delivery. And the on-loan Irishman then capitalised on some hesitancy by George Elokobi to deal with Stevens’ floated pass, only to send his shot over the bar. Meanwhile, there was little to trouble the visitors at the other end of the pitch, as they comfortably held on to their lead at the break. Colchester replaced Sammie Szmodics with Tarique Fosu at the interval in an attempt to improve their fortunes. But instead Pompey found themselves further ahead just seconds after the restart – much to the delight of their large travelling army. And it was BENNETT who doubled his tally for the week when, following good work down the right, Naismith selflessly squared for the winger to tuck home. United came close to reducing their deficit moments later, but a stretching Chris Porter could not quite reach Dickenson’s cross. But the Blues were still looking to get forward themselves and when Colchester switched off from a throw, Bennett picked the ball up and neatly side-stepped his man before blazing the shot wide. Stevens then collected Naismith’s shot free-kick and beat a defender, only to see his arrowed drive deflected just past the post. United were looking all at sea and it came as no surprise when Pompey extended their advantage further just past the hour mark. Eoin Doyle did well to slide the ball through to ROSE, who saw his first shot blocked by Walker before neatly dinking home at the second attempt. The keeper was almost caught out by Naismith moments later, but quickly back-pedalled to claw the ball clear. Colchester had not created much at the other end and when they finally did get forward, it led to Pompey’s fourth goal. The visitors broke quickly up the pitch from a corner, with Michael DOYLE surging forward to tuck away his first of the season after Naismith’s initial effort had been saved. That was Naismith’s last bit of action, as he was immediately replaced by Noel Hunt, with Gary Roberts and Conor Chaplin joining him on the pitch soon after. And there were no nerves in the closing stages as Pompey comfortably saw the game out to complete an enjoyable afternoon in Essex. somebody who has recently made eggs: WIFE ME UP!!!!! 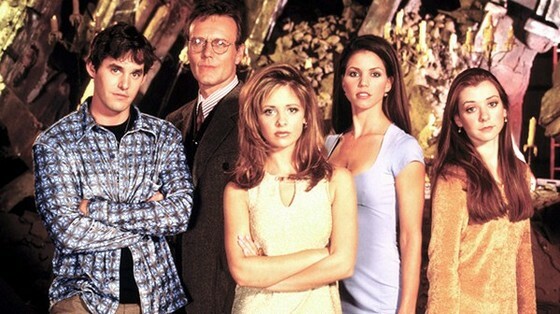 20 years ago to day the greatest TV show of all time first aired. I wasn’t into it from episode one as I thought the film was a bit so so, just remember catching the end of a few episodes as I think it was on before Star Trek. My opinion soon changed.